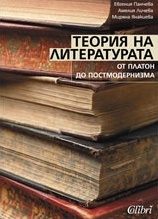 The evolvment of theoretical ideas on literature from Plato to our days has been followed up for the first time in Bulgaria literature. The publication is aimed at humanities students. Assoc. Prof. Ameliya Licheva, PhD - department: Literary Theory, Faculty of Slavic Studies, Sofia University "St. Kliment Ohridski". Editor of the weekly “Literaturen vestnik” (“Literary Newspaper”) and columnist of the newspaper “Kultura” (“Culture”). Assoc. Prof. Evgenia Pancheva, PhD - Department of English and American Studies, Faculty of Classical and Modern Philology, Sofia University "St. Kliment Ohridski". Miryana Yanakieva, PhD - department of Literary Theory, Institute for Literature, BAS. They co-authored the work “Theory of Literature. From Plato to Postmodernism", published in 2005.